Light The Sky and Eriel Indigo summon an airy future bass "Mothership"
LA-based producer Light The Sky teams up with vocalist Eriel Indigo on the soaring pop-influenced future bass track "Mothership," out now on Spotted Records. Heartwarming, nostalgic lyrics about childhood tire swings coincide with the ethereal, otherworldly sound design, transporting the listener to another place altogether. Light The Sky is a new visionary project from the producer Atla Gadret, who experiments with potent elements of future bass, electro pop, and modern trip-hop to create an uplifting sonic journey for the ears and heart. With performances at storied festivals such as Coachella, Lightning in a Bottle, and Shambhala under his belt, Gadret is no stranger to the limelight. Keep an eye on this talented creator as he ascends the rank and ignites hearts with his soaring, anthemic compositions. 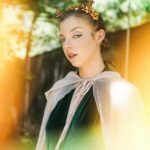 Eriel Indigo releases new rainbow flavored track "Rebels"